One of the first projects that got me into wargaming was building up a platoon of Brits ready for operations. These inital guys were from Empress and, I’ve got to say, it’s a pretty definitive range if you’re wanting to play battles from 2010 onwards. However, the War on Terror saw some pretty major changes in the British Army’s equipment so what works for 2010 are not suitable for players wanting to run battles in 2006 or earlier. Which is why, when the Eureka Modern British were first shown off, I was very interested in picking up the range to add to my collection. The new range is currently 20 figures, consisting of three standard fireteams (2x L85s, L85 + UGL and LMG) and a selection of heavy weapons and specialists. The figures are all kitted up for the starting period of the War on Terror, with Mk 6 helmets, Osprey vests and not a rail in sight. The figures are sculpted by Kosta Heristanidis and packed full of his style (not heroic but with some of the guns slightly oversized for easy readability) with plenty of detail. There are some really nice little bits on detail on the figures, such as knee pads around the ankle. They also scale pretty well with other Eureka figures (such as the ANP I use in every comparison) and other ranges. Expect a more in-depth size/kit comparison once I repaint my Empress guys. As for painting these guys, it was really simple. There is plenty of detail for the final wash to pickup. My DDPM recipe is really simple (Iraqi sand base, Beige Brown applied in sweeps) so painting this block of 20 didn’t take anywhere near as long as certain OTHER camo schemes. It’s probably not the most accurate way of painting it (I won’t be winning any awards) but it does help to evoke the camo pattern. The only right pain when finishing them off was painting up the helmet netting. Although annoying, I think the final effect makes it worthwhile. The first fireteam has the chaps posed in an advancing state, while moving under fire. The second team has engaged and are in firing poses. LMG and an AR are firing from the shoulder while the UGL gunner has learnt forward to engage. The last figure is in a crouched position. To give your team some extra bite, there are several other weapon available. First up is some guys wielding the good old Gimpy. These figures are sold individually with two variants. Figure 1 is looking ally having taken off his shirt to beat the desert heat. I’m pretty sure I’ve seen some of the inspiration for this guy in the “British Army in Afghanistan” book I used as reference when painting. Figure 2 on the other hand is wearing long sleeves but seems to be a big fella (the sort you’d nickname Tiny) while firing the GPMG from the hip.I also like how both of these guys have pistols on their vests. Another option is to give your team sniper support. This pack has two figures in it and a tripod for the sniper to rest his rifle on (not pictured). The sniper is armed with an Accuracy International rifle while his spotter is using his scope to assist. These guys would work great if mounted on a weapon team style base but also work well on individual bases. The last pack available are four extra specialists. Two of the team are designed to counter any IED threat (one with Vallon sweeper and the other carry an IED jammer) while the other two give you figures for your platoon HQ. One of them is your radio man, while the other holds a 51mm platoon mortar in his hand. So what do I think of the models? I really like them. The Eureka style is one I quite like and getting some Brits in it is great. There is something iconic about the look these figures are wearing and give me a good chance to paint something other than multicam. My only comment would be that producing three fireteams rather than four limits you to only one squad + fireteam of unique poses (assuming you don’t swap some guys out for the sweeper or a GPMG). However, I’m quite happy with the final result – expect to see these guys on the field standing in for the Republic of Aden’s Defence Force. If you’re wanting a set of these for yourself, they are currently only available via email from Eureka but will be coming out on general release (meaning it should be available in the UK through Fighting 15’s) around Salute this year. Nic at Eureka also mentioned that the range will also be available with the guys wearing berets. 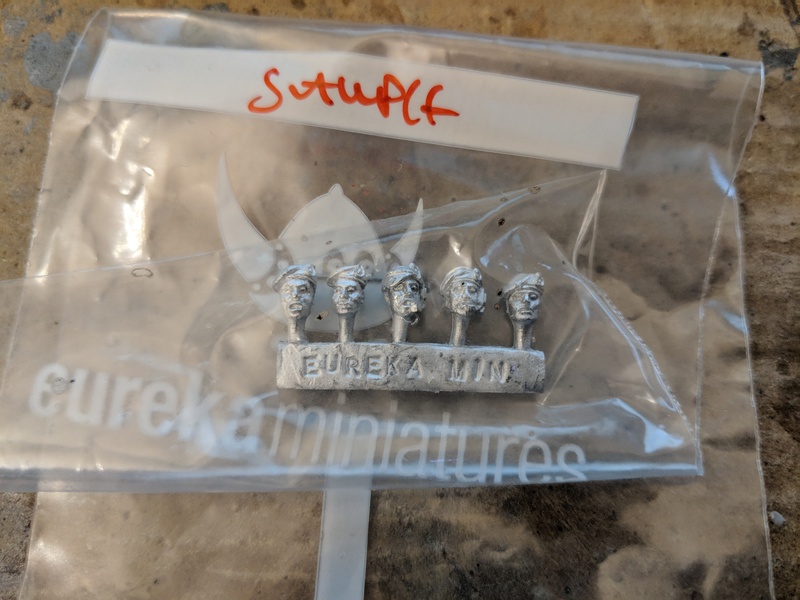 I actually have a pack of the heads which were included and I really like the look of them… so I might have to pick up some more to round out the squads.